Get to know our amazing friend and client, Dana! We are inspired with her transformation — both inside and out. If you ever wondered if you could lose weight by doing barre, Dana is proof. She lost over 50lbs at RISE! We are so proud of Dana and we hope you enjoy hearing her story!! 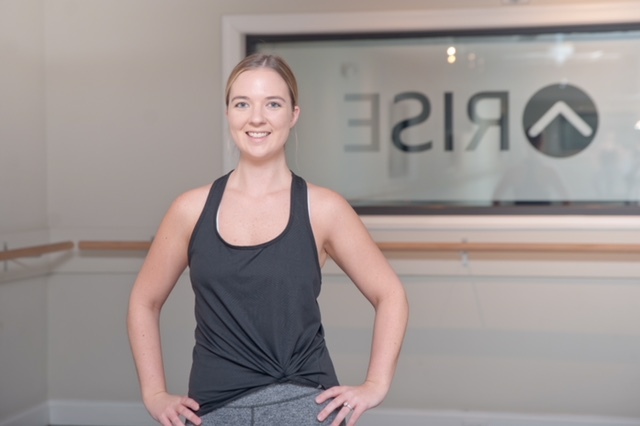 How and why did you get started with barre at RISE? I started going to barre because of my cousin, Julia Rubenstein, a RISE instructor. After attending her wedding in March I had to know her “secret” to looking so amazing on her wedding day and her immediate answer was BARRE and just barre! I was planning my own wedding at the time and it did end up taking me until June to finally pull the trigger, but after I attended my first class I was HOOKED!! What changes have you discovered both mind and body? What changes haven’t I discovered? Barre has given me back, actually no, barre has just given me a level of confidence I never had before. There is something so special to me about waking up and not stressing about what clothes to wear that day, how they will make me feel, what I will eat today to combat the feelings I have about the clothes I’m wearing and how I feel in them. I feel comfortable in my own skin and there is nothing more beautiful than that! I spend so much LESS TIME worrying and so much MORE TIME living and loving my life. RISE Barre & Fitness has been a gift for both my body and mind! What do you love most about barre and RISE? RISE Barre is so unique to any other workout/gym/personal training routine I have tried and I am so thankful for that because it is the one that works for me! I find it almost relaxing when I walk in. It’s 60 minutes just for me; surrounded by a community of strong women all in their sticky socks, feeling the same burn and shake I am, until we walk out the door feeling AMAZING! I think the best part for me is never really having the feeling of “ugh I don’t want to go today”. I look forward to going to each class I have signed up for whether it’s at 5:45 in the morning or 7 at night! What would you like to share about your own personal journey? Before I made the choice to go to RISE, I was feeling very emotionally and physically drained each day from doing nothing. I ate poorly. I was moody and unhappy. I just wanted to snap my fingers and feel and look different. Within the first 2 weeks of going to barre I was seeing changes in both how I looked and how I felt. The motivation came naturally to me after the first class and it just got better from there! It was mid-summer and I did not dread trying on bathing suits, I was buying new shorts as my old ones were too big. Then finally the day came, the real reason I started at barre, my wedding day…all I wanted was to feel beautiful that day. I put my dress on and looked in the mirror and thought to myself “I did it”. Well, the wedding is over but my journey at RISE Barre & Fitness is far from over! It is a part of my daily routine now as it has been a lifestyle change that was the easiest one I could have made! What is your best advice to someone who wants to try barre? Or someone who wants to make some physical or mental changes? My best advice is to just try, just show up and do it. You will never regret a workout, especially at RISE! My second piece of advice, once you get used to the style of workout, dedicate at least 4/5 days a week to go because that is when you will see the results you’re dreaming of! Do not get discouraged, even though it is easy for me to get to barre does not mean it is easy once I am there, it is challenging each and every time and I love it! So very thankful from the bottom of my heart to everyone at RISE and especially my fitness/beauty mentor Julia! !